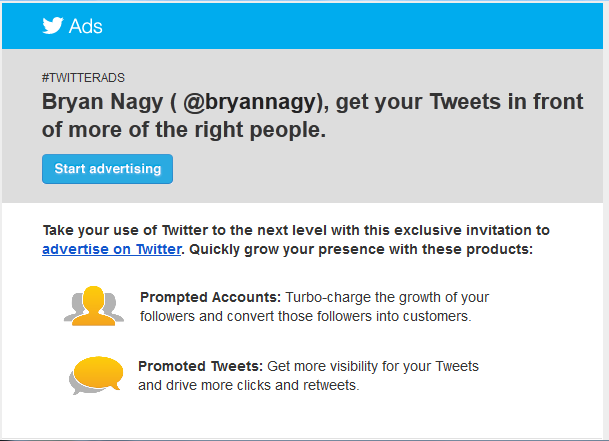 Twitter has officially opened up its advertising offerings to all users. Prior to now, only large brands and agencies were able to purchase the advertising directly through Twitter. This spring, its advertising capabilities increased as Twitter opened up its advertising platform to small businesses with a partnership through American Express. Now, Twitter has expanded its offering to users across the social media site, not just businesses. The announcement was emailed to users as an invitation to try out Twitter’s advertising offerings: promoted trends, promoted tweets, and promoted accounts. Used correctly, these advertising capabilities can increase a user’s presence and engagement on Twitter. There are, however, times when brands have seen devastating consequences of the real time social media site, and I have covered these in the past. Interested in advertising on Twitter? Click here. ← Social Traveling. Next step: Social Flying. Take the Survey!